German chancellor Angela Merkel is holding a visit to Skopje today. During a joint press conference with the Prime Minister of FYROM, Zoran Zaev, Merkel said that the referendum concerning the name dispute which will be held on September 30th is a historical opportunity for the country and its citizens. “The referendum is an opportunity for your country’s EU and NATO perspective. More work is needed, but September 30th referendum is a prerequisite. This is a historical opportunity that doesn’t come so often”, said the German chancellor. Merkel said that Germany has delegated an advisor for economic affair to offer support for the reforms in the country. The German chancellor was also asked about the idea of territory swaps between Pristina and Belgrade, to which she answered that Germany and Europe wanted a stable region, where the territorial integrity of each country is respected. 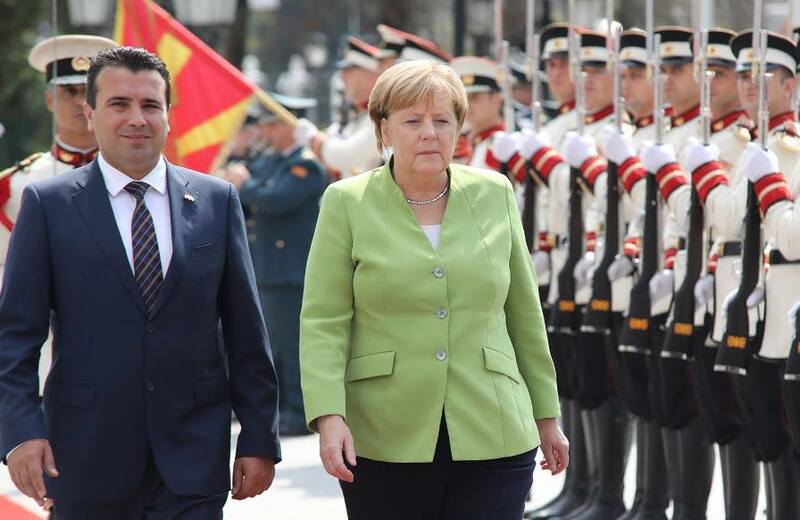 On his part, PM Zoran Zaev said that the visit of the German chancellor acts as an encouragement ahead of the referendum on the name. “This symbolic visit on the day which marks our independence is a very precious advice for us and it also acts as a guarantee for our accession in the EU and NATO”, PM Zaev said.